"A male narrator reads James Howe's popular story (Atheneum, 1999) about best mouse friends and intrepid adventurers Horace, Morris, and Dolores. Their friendship is tested when Horace and Morris join a club that doesn't allow girls, and Dolores is left to adventure alone. But, "a boy mouse must do what a boy mouse must do," and soon Dolores joins the girls only "Cheese Puffs" club. Dolores gets bored with the lack of adventure and, joined by another girl mouse, heads to the boys' clubhouse to rescue Horace, Morris, and the equally bored Boris. 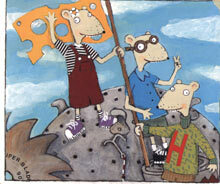 The five mice explore together and learn that the best clubs include everyone. Jason Harris provides a spirited reading complete with humorous voices for each character. The story is accompanied by music and sound effects that enhance the book's illustrations. Side one includes page-turning signals, while side two contains an uninterrupted reading; On the CD, track 1 contains the page-turning signals, while track 2 does not. A great choice for school and public libraries." "Adventure is the tie that binds for these three friends. "From the depths of the seven sewers to the heights of Mount Ever-Rust," Horace, Morris, and Dolores go jaunting with gusto. When the Mega-Mice and Cheese Puffs clubs threaten to separate them, the strength of their friendship prevails. Jason Harris creates fine mouse personas, with just the right level of delight or despair as the friends separate, reunite, and attract new buddies. The musical accompaniment is light, and the sound effects bring depth to each of the scenes. The young listener will be pleased by this total package."